As much as many personal finance bloggers abhor the idea of purchasing a car on finance, it is interesting to know that in the year of 2018 more than 3 quarters of the cars sold privately in the UK were in fact bought using a finance arrangement. It is understandable then that many people may at some point find themselves in a position where they need to sell or change their vehicle while it still has some kind of finance attached to it. So is it possible to do this? The short answer is yes, it is possible to sell a car that still has outstanding finance attached. As with many things in life however, it’s not quite that simple. When people think of selling a car they often think of a private sale. If your car is subject to finance however, you may find that the terms and conditions of your finance agreement prevent you from selling the vehicle in this way unless the balance is paid off first. If this is the case then it may be worth contacting your finance company to either ask for their permission to sell the vehicle or to discuss any other available options. Even if your finance company or finance agreement does allow for a private sale, you may still struggle to find a buyer for your vehicle if it still has finance attached to it. Nowadays buyers are very wary of purchasing vehicles with outstanding finance and it is very easy for private purchasers to find out whether a vehicle has any outstanding finance by using simple text messaging or internet services. Why would they need to check? They would need to do this in order to avoid being chased for the repayment of the outstanding finance after taking ownership of the vehicle, or even having the car repossessed. There are laws in place to protect buyers in this situation but they are also not straightforward. If you would like to know more about the legal implications of buying a car with finance outstanding then you can find some good information here. We can see then that even though it is possible to sell a car with finance attached, it may not be easy – or some might even say ethical – for you to do so. So what are some of the options available to you if you really do need to sell your financed vehicle quickly? Here are 3 options you could consider. One way to deal with this situation would be to temporarily borrow the money needed to clear the outstanding finance on your vehicle, and then repay the loan once you have sold your car. Or if it works out better for you financially, you can always keep the loan and put the money towards your next vehicle if you were planning to finance your next purchase anyway. If you are going to borrow money on a temporary basis then it will be important that you choose a loan with no early repayment penalty. If you have a family member who could loan you the money to clear the finance interest free until your car has been sold then this would obviously be helpful. If you do choose to go down the personal loan route and sell privately, be sure to get written confirmation from your finance company that the balance has been paid in full and that the vehicle is no longer subject to finance. This way if one of the services that we mentioned earlier which provide vehicle finance checks for buyers, fail to update their records, you will have proof for any potential buyer that the finance agreement has been settled. If you simply can’t raise the money to clear the finance then there are still options available. Companies like webuyanycar.com* specialise in buying vehicles that might be difficult to sell under normal circumstances, like those which have outstanding finance agreements. You may or may not get as much for your vehicle as you would with a private sale but it is certainly a viable option. If your circumstances would allow you to trade-in your vehicle rather than sell it, then trading it in at a car dealership may be a good route for you to go down. 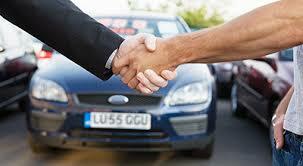 Car dealerships will often be able to settle your outstanding finance when you trade in your vehicle for a new one. Be very careful here though as the complexity of these agreements can make it easy for you come out with quite a bad deal. So be sure to go over any figures and contract terms with a fine tooth comb, making sure that there are no silly interest rates, hidden fees or misleading clauses involved with your trade-in agreement. As we said at the start of this post then, it is certainly possible for you to sell a vehicle with finance still attached but it may not be straightforward. The good news is that there are several options available, so hopefully you won’t be stuck with your vehicle for any longer than is necessary. Is it Environmentally Friendly to Scrap a Car?